Star Blaster – The game you probably know Mark Kriegsman for. FastLED6502 – If an Arduino can do it, the Apple II can do it better. Inside FastLED – More info about Mark’s project. Space Cadets – In case you’re a boardgamer, like Quinn. BASIC Source – Microsoft’s original code found its way into the wild. Jobs filming – The celluloid is finally rolling on the Sorken film. Jobs cast – Photos of the cast of the upcoming Jobs biopic. Apple II Web Server – A mysterious Dave Schmenk project. PLASMA – Dave’s awesome Apple II programming language. Lawless Legends – The incredible game that uses PLASMA for mission scripting. CiderPress 4.0 – A long awaited new version of the best disk image tool. John Romero to the rescue – The late Bob Bishop’s Apple II collection gets rescued. Jason Scott’s photos – The West Coast Computer Faire like you’ve never seen it. More photos – Thanks for these, Jason! Akalabeth re-reviewed – The clever iOS port is back in the news. Retro StackOverflow – Help us make this awesome resource a reality. The Home Computer Wars – (PDF warning) Read it while you can? Apple’s Fonts – Who doesn’t love fonts? Yay Helvetica! Helvetica – The documentary for type nerds. Halt And Catch Fire – Play Spot-The-Apple-II with your friends. LCD SD Disk II – A screen for the new(?) Korean solid-state drive. SD Floppy II – The Bulgarian staple, not to be confused with the Korean device above. UNISDISK – New firmware for the Nishida Radio masterpiece. CFFA3000 – The card everyone wants, and which makes //c users jealous. SmartDisk – The floppy-disk-SD-card adapter thing that doesn’t seem to actually work. Carmack //c – John teaches his kids to program on the best 8-bit computer. VisiCalc on NPR – A great PlanetMoney story about the Apple II killer app. Drop /// Inches – Mike and Paul’s dumb show about dumb stuff that is also great. Carte Blanche closed – No more orders in this run of the Carte Blanche II. Snow IIgs – Dagen Brock’s fun little micro-demo. FTA XMAS – The original demo that snows. 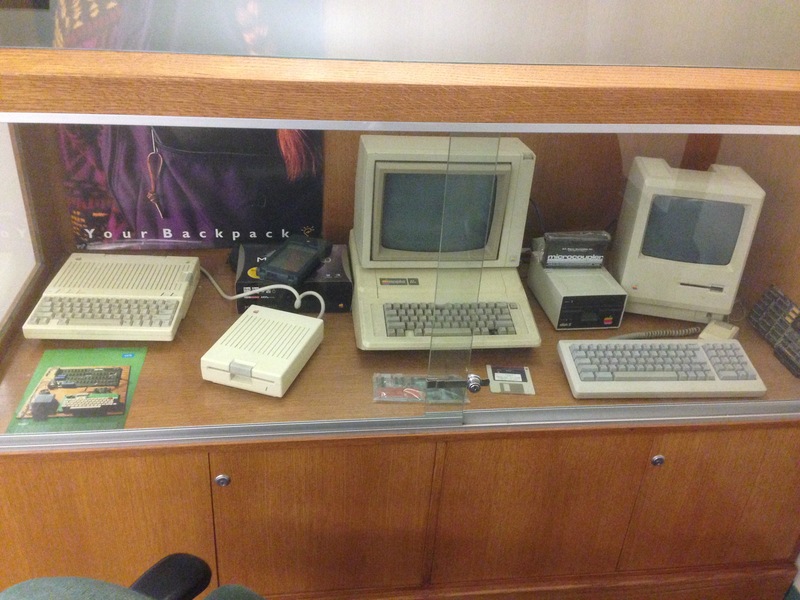 Stanford Display – Some kinda sad looking Apple IIs in a prominent place. 65xx Boards – Now can be acquired in exchange for dollars. Classic IDE – The solid state options for Apple II are multiplying like bunnies. MC1 Clone – Courtesy of Plamen, everyone’s favorite Bulgarian. VCFs – They are everywhere. VCF on Floppy Days – An interview with Evan Koblentz. VCF Photos – A nice gallery of the galleries. TRW Swap Meet – Great old-school swap meet. LCD //c – An LCD in an old Apple //c monitor. WozPak in hardcover – Keep it classy! Cubit 128 – Q*Bert clone patched for the everyperson Apple IIe. Virtual II updated – The best emulator gets better. Stynx music – Apple II electronica music. Joe Ely B4 84 – He’s on tour supporting his Apple II+ music. Jonathan Mann – The song-a-day guy releases an Apple-themed mixtape. Music Master RPG – A low-res music-themed adventure game. JACE – It’s a thing again! Emulate your Apple II in Java. Beagle Bros on Coding Horror – Sadly, no mention of our show. OC Register – We feel dirty linking to this again. Woz in a Cadillac? – No, just in the commercial for some reason. Nissan Leaf – Want a Tesla? Can’t afford one? The Leaf is super awesome. Every Apple Ad – All the commercials. Yes, really, ALL of them. A2Central – The best source for all Apple II news. Thanks Sean! Call-A.P.P.L.E. – Expanding their coverage to other Apple products. GEOS – Finally, a download link for the original, incredible, amazing Apple II GUI. ShrinkIt for Mac – Get at those IIgs archives. Another option here. Pinball Construction Set source – Yay Bill Budge! Jesse Blue – The myth, the legend. Ninjaforce lives! Halley and Ultima – Two weird games, one magazine. Beagle Bros Disk Care – Watch out for toasters and alligators. Supermartian – Mike’s weird game. Knights of Legend – Quinn’s weird game, too big for its breeches. KoL Screenshots – So purrrty! DiscoRunner – Run your Lo-Res AppleSoft graphics in 3D for some reason. Merlin32 – The awesome Windows-based cross-assembler for Apple II. ReactiveMicro – Transwarp GS clone and No Slot Clock clone almost ready! Merlin32 – The awesome ???Windows-based??? cross-assembler for Apple II. Another great episode guys. A Transwarp GS clone would be great. Can’t wait to get mine. Hopefully you guys will have a review for the next podcast. Did I mention we need more IIGS content? More IIC content as well please. So I did manage to get my broken IIGS working to read 3.5″ floppies. I replaced the VGC chip and managed to get the socket working properly. The system is working as it should. And I did find a copy of Task Force swear hack. Thanks guys for the suggestions on where to look for it. Those Night Owl lcd screens work great. Got one for my IIC. Another great podcast. Thanks to you both — and anyone else involved. When I noticed it was 3 hours long, I put it off for a couple of days in favor of a few short podcasts that fit my ADD-ness, but once I started listening, it went by *like that*. Mark was a great guest. You should have more Apple II game programmers on the show.